What is the difference between Australian Labradoodles and other Labradoodles? A Labradoodle… a Labrador crossed with a Poodle, right? Well – no actually, it’s not quite that simple! There are several types of Labradoodle, and they are all quite different, so it is important to understand the differences between them. If you take a Labrador and cross it with a Poodle, the resulting puppies are usually referred to as first generation (or F1) Labradoodles. Take that first generation (F1) Labradoodle and cross it with another first generation (F1) [or higher] Labradoodle, and the resulting puppies will be second generation (F2) Labradoodles. 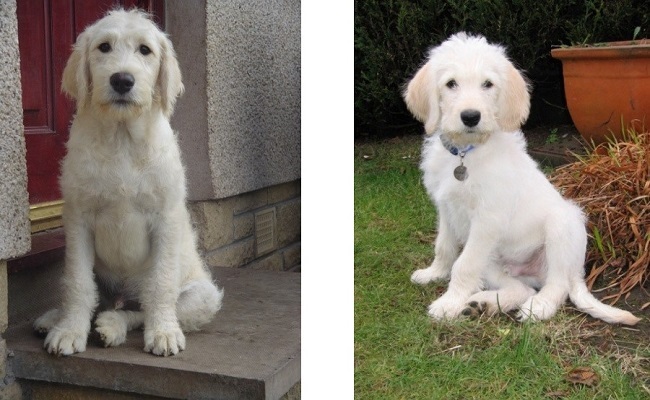 Take a second generation (F2) Labradoodle and cross it with another second generation (F2) [or higher] Labradoodle and the resulting puppies will be third generation (F3) Labradoodles. So you get the gist…you just add one generation to the lowest generation parent to determine the generation of the puppies… but that is not all… it is very important to note that there are four common terms used to refer to the Labradoodles we’ve just discussed. All of these terms can be used interchangeably and refer to any dog which has come from Labrador and Poodle lines only. For our purposes here, we shall use ‘Early Generation Labradoodle’ to refer to these dogs. Now we’re going to introduce the Australian Labradoodle, which is very different to and distinct from the other Labradoodles we’ve discussed so far. Australian Labradoodles have more than just Labrador and Poodle lines in their pedigree. We can categorise Australian Labradoodles by generation the same way we do with other Labradoodles, but as opposed to the F1, F2, F3… terminology, we use ALF1, ALF2, ALF3… where ALF stands for ‘Australian Labradoodle Foundation’. However, since most Australian Labradoodles are now a very high generation (they’ve been bred for over 35 years), we usually just refer to them as multi-generation Australian Labradoodles since there is so little difference. But what difference does this make? What is the real difference? Do Australian Labradoodles look or behave differently to other Labradoodles? In short – yes they do. There are a multitude of differences in fact, and having bred both here at Lomond Hills in the past, we have a great deal of experience in this area. Early Generation Labradoodles are, as the term implies, are of low generation. This means that there is very little consistency in the litters of puppies produced. If you cross a Labrador with a Poodle, the resulting puppies vary considerably in size, coat type and temperament. When you get to the second and third generations, things get even more complicated as the genetics play out and throw-backs start appearing. This means, for example, that a second or third generation Labradoodle could look like a poorly bred Labrador or a poorly bred Poodle rather than a Labradoodle. There is much, much more consistency in Australian Labradoodle litters. This is primarily because we are now so far down the generations, and as we breed further, physical characteristics and attributes become more predictable and consistent. Every puppy in an Australian Labradoodle litter will be recognisable as an Australian Labradoodle and throw-backs to parent breeds are very rare. Being only a few generations away from a Labrador, it is no surprise that the vast majority of Early Generation Labradoodles DO SHED their coats and are therefore NOT suitable for allergy sufferers, despite what you may have been led to believe from other sources! Australian Labradoodles on the other hand, are many more generations away from the shedding Labrador; their coats have been developed over the last 35 years such that they DO NOT SHED and therefore have a very high compatibility rate with allergy and asthma sufferers. Whilst there are some Early Generation Labradoodles with fantastic temperaments, they do tend toward the lively and potentially hyperactive side, particularly when compared to the calmer, better-balanced Australian Labradoodles. In fact, Australian Labradoodles are particularly intuitive, very intelligent, easily trained and are excellent with young children making them an ideal family member. However, they are still full of fun when playing outdoors and can be incredibly comical at times! We have now stopped breeding Early Generation Labradoodles and are focusing all of our efforts into preserving and developing the Australian Labradoodle here at Lomond Hills. If you are interested in bringing an Australian Labradoodle puppy into your life, please click here to see the litters we have just now, and coming up over the next few months. You can also contact us for further information or to arrange a visit to meet us and some of our Australian Labradoodles.